Passing slowly through countries, crossing land borders you gradually notice changing customs, architectures and surrounding landscape. Cross over the Müstair valley border from Swizerland into Italy there was an instant change - the road condition rapidly degraded, the cars got smaller (from four wheel drive BMWs to fiat puntos) and the driving faster and more crazy. The language, much to our initial surprise however did not. 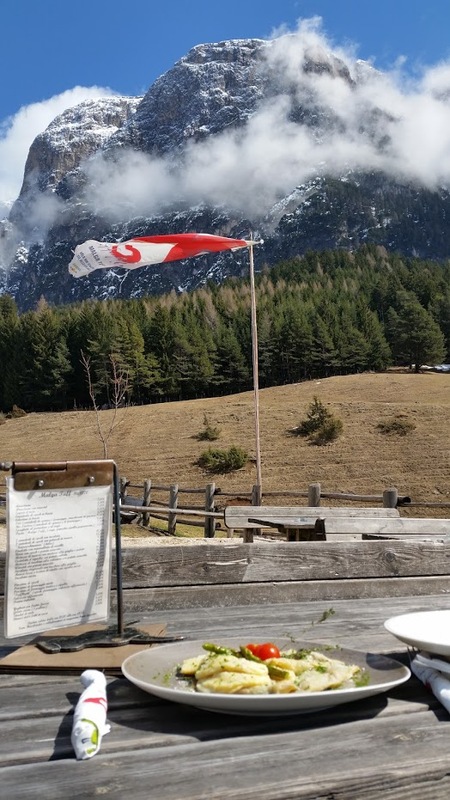 In the South Tyrol (or Alto Adige) region of Northern Italy 62% of the population speak German and only 23% speak Italian as their first language. The farmers also dress in a very distinctive bright blue apron - apparently feeling lost without it. It was a great descent down the Venosta valley, gradual and deserving after all those mountains climbed in Switzerland. There are well marked cycle routes that keep you off the main roads and take you through acres and acres of apple orchards. 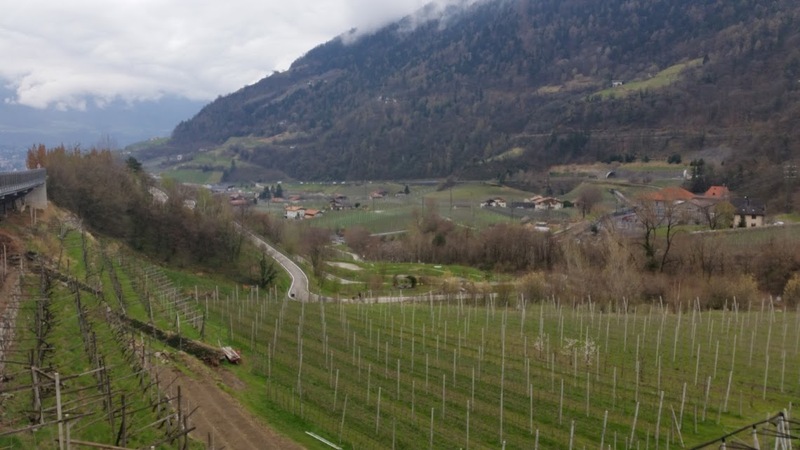 They harvest 5 billion apples from the region every year from 18,000 hectares of orchard, meaning that every 8th apple in Europe is a product of South Tyrol! None of our photos really do the scale any justice, although I imagine it would be a beautiful place to visit in early summer when the blossom is in full bloom. 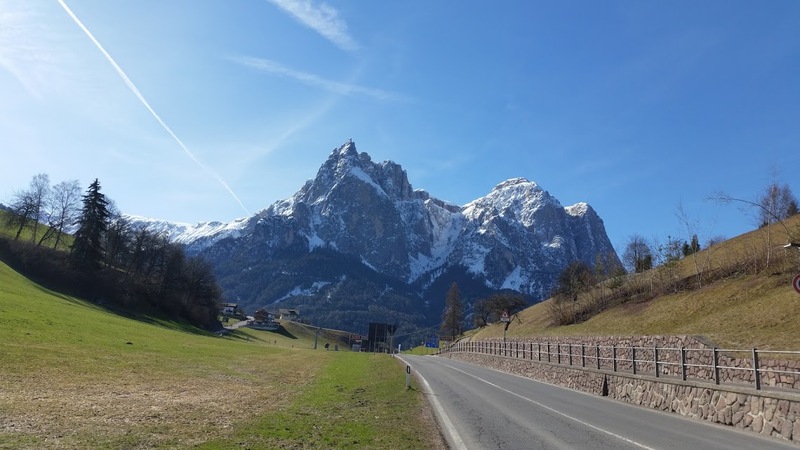 Of course downhills can’t last forever and we were destined to go up in order to reach the mighty Dolomites. 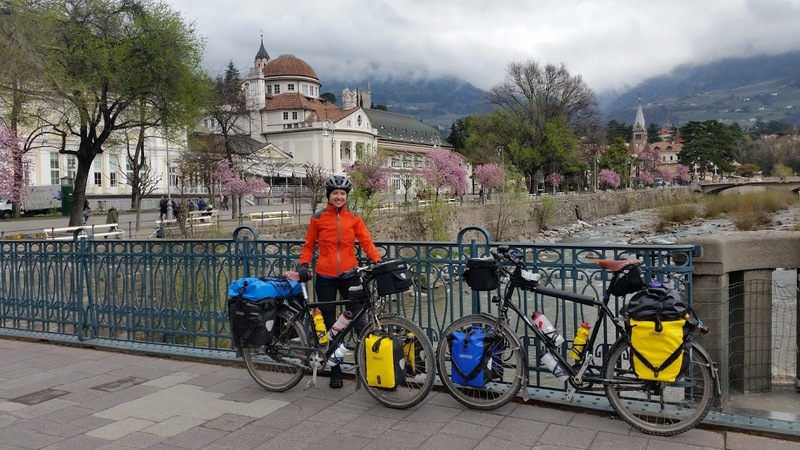 The cycle path took us through Merano and the regional capital Bolzano, before taking a very steep 400m climb up to the Dolomiti foothills and the 5* Seiser Alm campsite Alpe di Siusi with better shower facilities than most hotels!! With snow forecast higher up the next day we decided to stay and walk up to the refuge Tuffalm for lunch where we had the most incredible homemade Knödel (bread dumplings) with cheese and spinach, and white asparagus ravioli finished off with a buckwheat, almond and rasberry cake which we later ate in every other place we stopped for lunch!! But of course we need to earn our cake, so onto the passes of the Dolomites. After a busy start to the day getting past some heavy traffic on the road to Castelrotto the climb continued up to Passo Pinei at 1437m. Trying to avoid the tunnel at St Ulrich we climbed high above town but had to drop back to the main road before continuing the climb up to Passo Sella at 2240 - a big day of climbing (1700m of ascent) and we weren’t going to make it to the next pass from nightfall so had our first camp in the snow! 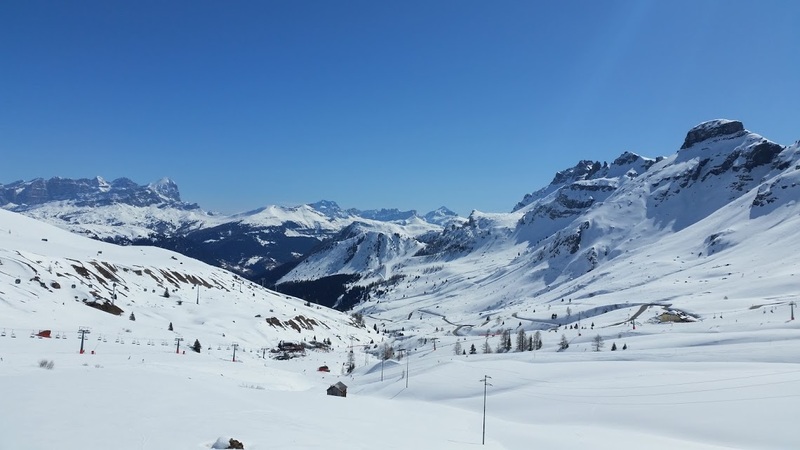 We awoke to a beautiful crisp sunny day and got straight into the climb up to Passo Podoi at 2239m, before descending 700m and climbing back up again to passo Falzarega at 2105m, again lusting after the few skiers that had the slopes to themselves. Again, beautiful but much steeper climbs than those in Switzerland so far! Down the valley to Cortina we finally felt we were in Italy, although a bit out of place with everybody being very well dressed and the prices in the bakery almost back to Switzerland levels! Two thousand kilometres since we started and what a spot! 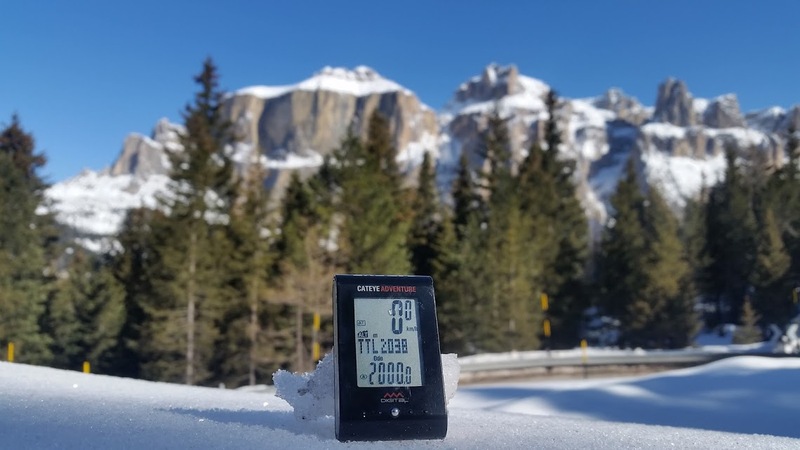 One more day in Italy and one more pass, a gentle 400m climb altough a false flat at the top fooled us a few times to get to passo Cimabanche at 1530m. 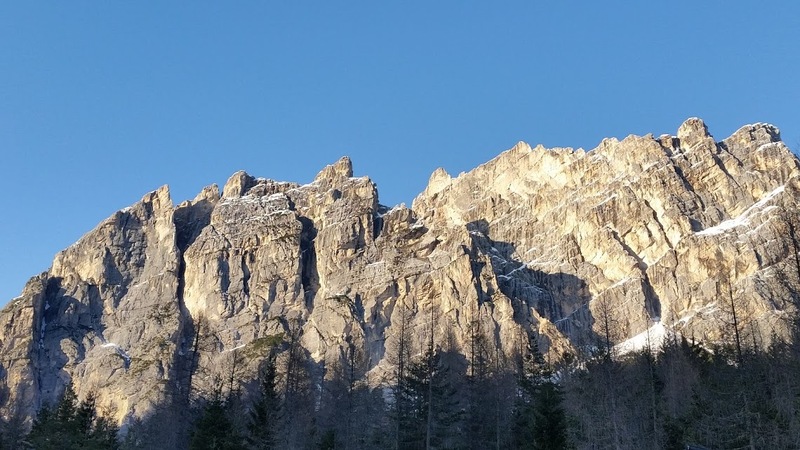 The descent was gradual to Dobbiaco with stunning final views of the Dolomites. 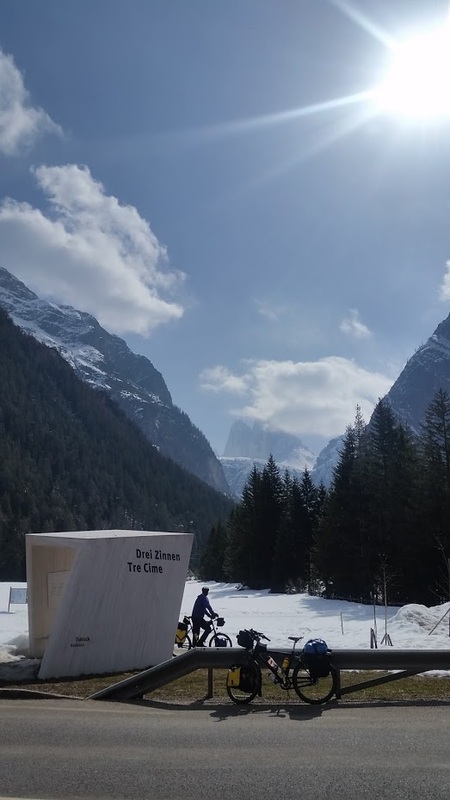 A seperate cycle path took us all the way down to Austria!